Behind my house every year on the Tuesday following Easter is living history, a Krakow Medieval festival. 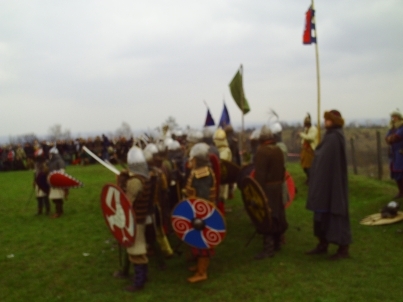 It is the Rekwaka tournament and reenactment of the Middle Ages that is connected to the founder of Krakow – Prince Krak. Rękawka means sleeve in Polish. It was said that people moved the earth from to build the burial mound of Krak. It again is a stone’s throw away from where I live. I was lucky to take some photos, although next year I will try to bring my better Camera. It is really amazing running for about 10 hours with something different every hour. 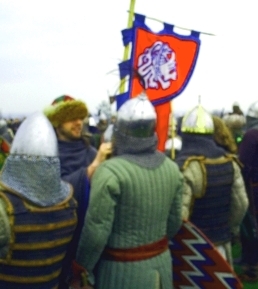 I would love to be a reenactor and it would be good for my Polish. During this festival there is a small church behind my house that is open only once a year. There is a great legend and mystical history around this chapel that I think I will save for another post. The festival starts at 8 am has of course dancing, Medieval music and a battle at 3 pm. The festival has a lot more of course including a unusual ending at 5:30 that I will not tell you about incase you ever go. It looks like some of the renactors actually might sleep there overnight. 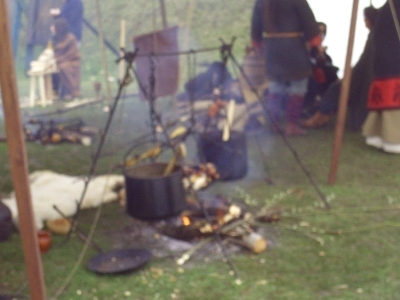 In the real Middle Ages fair were a very important part of economic life. This is when people came from all over to trade and do business. It was a precursor of the Market. It was a place where goods were exchanged by tradesmen. Remember there was no China, everything from candles to rope had to be produced locally so every town had its specialties. 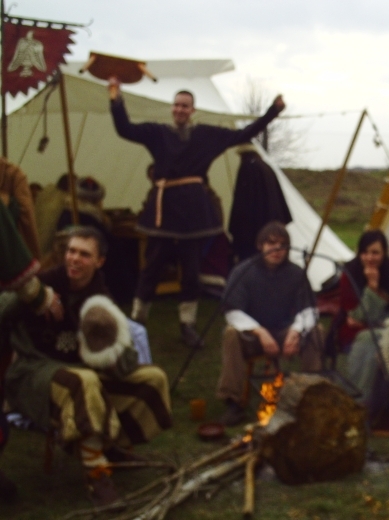 Fairs from the Dark ages to the High Middle ages were economic based as well as for other reasons. I have often though of Krakow and Poland in general as a Medieval city and place. The city is filled with living history. There are monks walking the streets, real ones and 800 year old churches everywhere. 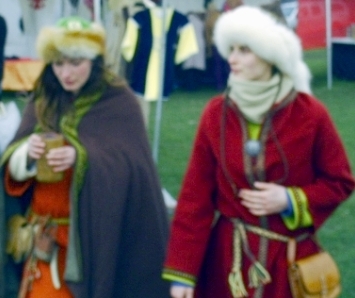 There are many people with Medieval costumes walking around the city even on none fair days. I think these times are more in the collective unconscious of the people here in Poland more than most places. I think the US and UK are too busied with iPads and CNN talk of crisis to appreciate history like people do in Poland. From the Dark ages to the 18th Century it was a great time in Poland. And of course it is a great time to live today in Poland. The last picture I hope you will enjoy are a couple of beautiful Polish princesses. I think Poles have very good values and ideas and the women truly are like ladies from the Middle Ages. No need for a time machine to see princess from the Polish centuries past, in Poland there are many Cinderellas and peasant girls who have the heart of a princess. Let me know what you think of these and pictures of Krakow’s Medieval festival. I know I need to improve the quality, however, the theme is interesting. Many people ask me why I am in Poland. I think the answer is obvious. It is such an interesting place, almost everyday I step outside my door and discover something new. Poland is a country that has many layers of history. Krakow itself has had inhabitants up to over 50,000 years ago and settlements and ancient things as fantastic as anything your real in Lord of the Rings. Thank you for the kind words and comments on my Medieval post. If you are of Polish roots you can apply for a Polish green card you know. I just love Poland and Polish people! I`m hoping that I will come one day to see all of your wonders. Big brothers hug from Serbia! I saw your medieval website it looks good. Serbia is on my list of places to see. I’m one of those from America and I’m very interested in Poland mainly because I’m interested in Polish WWII history and because my mother’s side of the family had to escape from the Russians and Germans from Poland that is now considered the western part of Ukraine today. But I’m also willing to learn as much as possible about the country not just about WWII history but as well I want to know just about everything when it comes to Poland. Such as mideval history, folklore and costumes, to traditions such as holidays and food to stuff that most Americans wouldn’t care about such as foreign and independent films which I wish more Americans could understand better which really bums me out but I do have some cousins that have gone to the country before and my cousin Erik likes to watch Andrzej Wajda when he saw Ashes and Diamonds at The Krakow Film Festival. So yes I’m open minded and willing to learn more about Poland or other countries no matter what it is. I was on trip in Italy when i saw this band playing Medieval music, I live in Poland now and maybe it would be nice to hear some typical music during these kind of events.